Surprisingly, neither the Prime Minister nor other cabinet ministers, tweeted in support of the home minister or retweeted his tweet – common practice in the BJP. 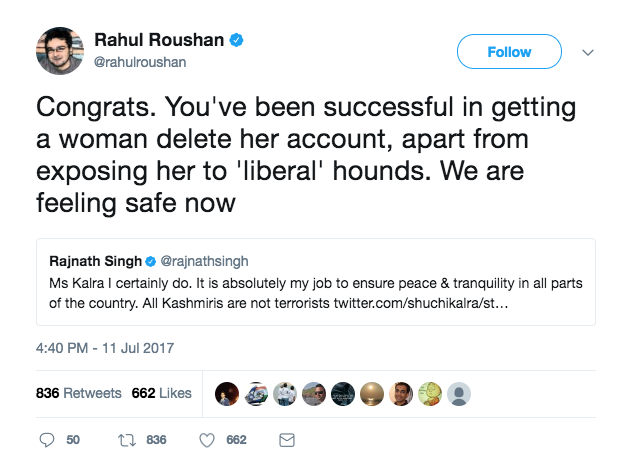 New Delhi: Union home minister Rajnath Singh found himself in unfamiliar social media territory on Tuesday as trolls who normally work as online shields for his party lowered the boom on him. 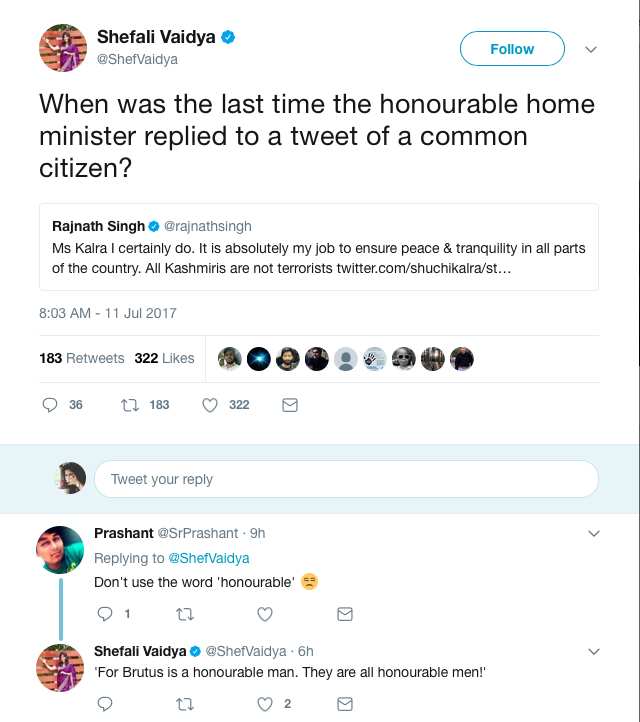 Within minutes of his first tweet, the home minister was subjected to vicious trolling by the ‘nationalists’ on Twitter. 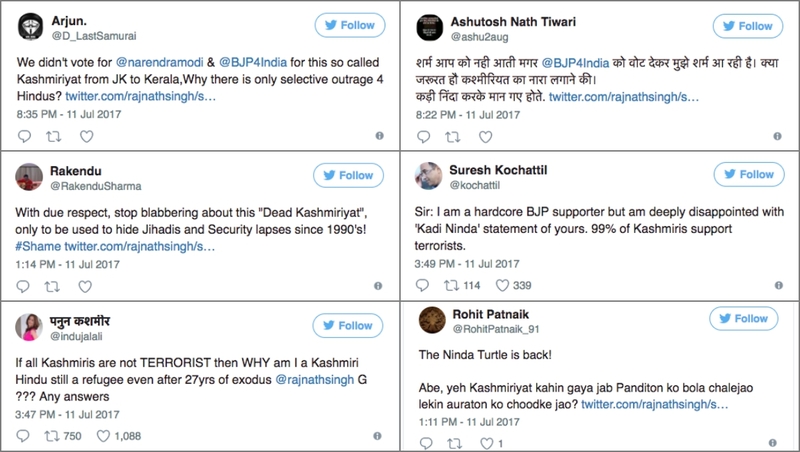 “Where was this Kashmiriyat when Kashmiri pandits were being kicked out?” tweeted Rohit Patnaik, whose Twitter bio claims that he is a “rightwing Hindu Oriya traditionalist”. 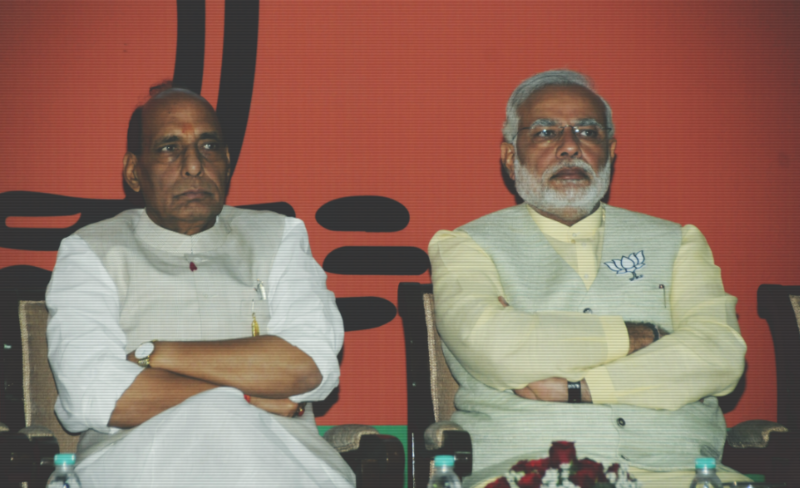 Many questioned if Singh was in fact a “Thakur” or if he had ever visited a RSS shakha. Some even demanded his resignation. 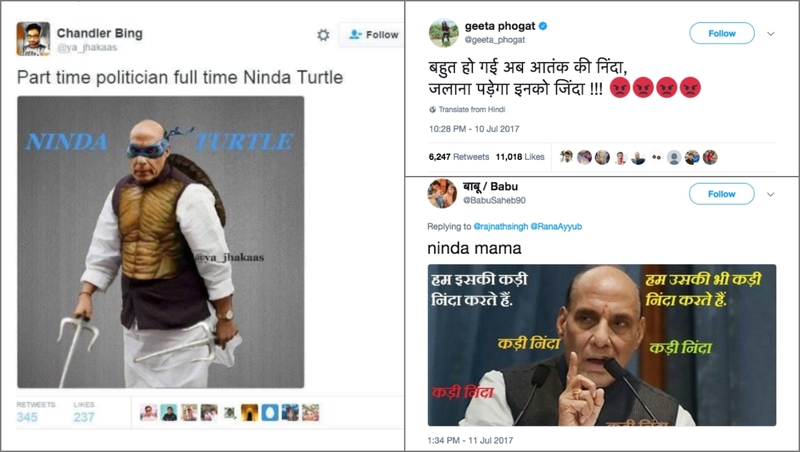 Singh, who is also called ‘Ninda Mama‘, is often trolled for his standard response – ‘We strongly condemn this’ – after similar attacks in the past. “Time for condemning terror has passed. Those responsible should be burnt alive,” tweeted wrestler Geeta Phogat. Singh was quick to hit back. 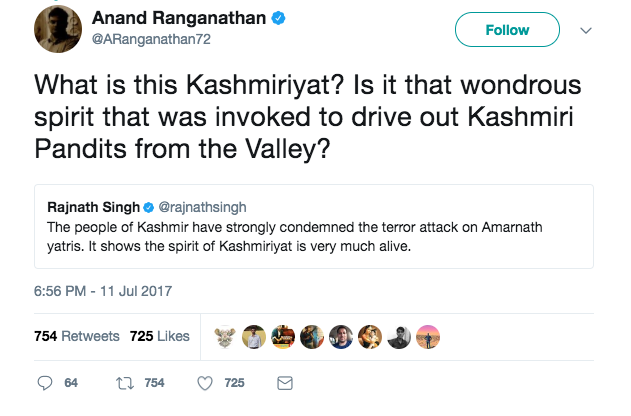 While Singh drew praise for his response from many who are normally critical of the Modi government, not everyone was impressed. 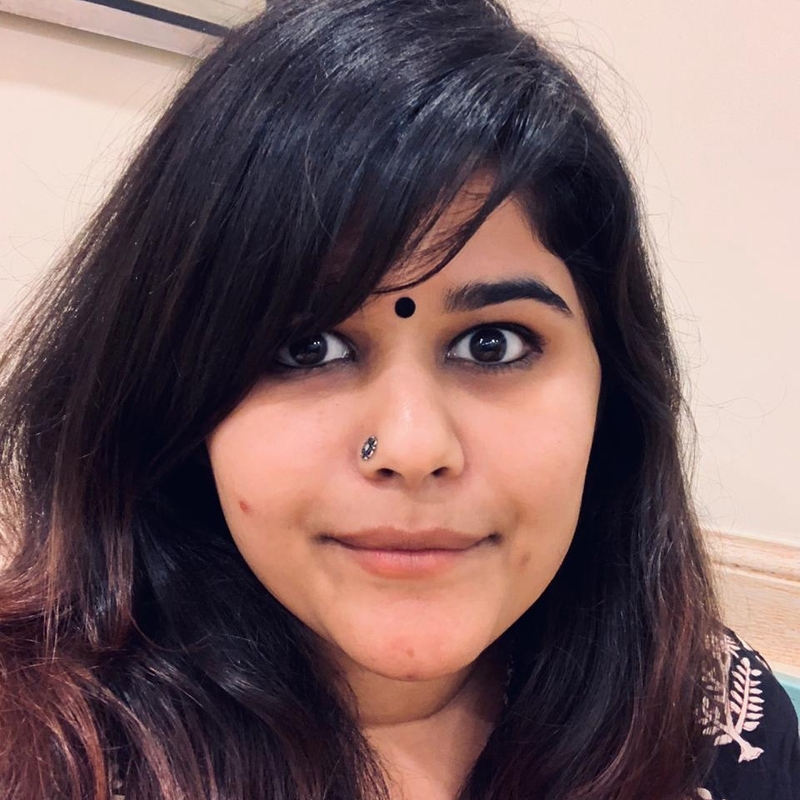 While Shefali Vaidya, a prominent right wing tweleb, compared him to Brutus, others slammed him for trying to score ‘brownie points with Commies’. Surprisingly, neither the Prime Minister nor the other cabinet ministers tweeted in his support or retweeted his tweet — which is common practice. BJP MP Balbir Punj was one of the few leaders who tweeted in support of Singh.